Pastor Toure Roberts and powerhouse author Sarah Jakes Roberts are reckoning forces in the faith and literary kingdoms. The co-leaders of One Church LA together redefine spirituality that encourages personal growth and a resurgence of purpose. But make no mistake, the Roberts do more than pastor. They successfully manage individual careers that globally impact thousands and complement each other. The parents of a beautifully blended family, the Roberts consistently devote time to travel, family, healthy living—and--lots of love, which is evident for the expectant Mrs. Roberts. They talked exclusively with Hope for Women about the early years of ministry, how they knew they were for each other, partnership and adding to the family. Hope: Sarah, you grew up in the church. Was ministry or anything close to it something you ever envisioned for your life? Sarah:Before I could fully understand the responsibility, honor, and privilege of ministry, I was a teen mom. I automatically assumed that disqualified me and began to shun myself from anything ministry-related. I could have never envisioned that there would be people assigned to the grace that’s on my life, making my ministry effective and relatable to them. Hope: As you frequented church, what were some of the major highs and lows that gave you your first true ideals of the church and what ministry was? Sarah:Frequenting church without a personal relationship with God often left me criticizing people and their errors. This allowed for many opportunities to be disenchanted by spiritual encounters and more consumed with human deficiency. I attributed gossip, betrayal, unforgiveness, and judgment as characteristics unique to church. I soon learned that such behavior is inherently human and has the potential to exist in any environment. Hope: What were some things that made you say, “There’s no way I want anything to do with ministry when I grow up”? Hope: When did you both realize there was a call upon your lives? Sarah:My first inclination that there was a call on my life came when I began writing a blog. In 2010 during the course of one of my more difficult life transitions, I began connecting with women all over the world. I learned through my transparency and vulnerability that I could encourage women to have a more intimate connection with God. Pastor Toure:I was in my mid-20s. During a life transition, I diligently began to seek God. In doing so, I surrendered to His voice and felt inspired to not only serve Him, but to serve others in His name. Sarah, did you ever have any inclination that you’d be a pastor’s wife? Sarah:No, not at all. Although I grew up in the church, I’ve never been a typical “church girl,” and one of my concerns with dating men within the church is that they were just trying to get closer to my father. Hope: Pastor Roberts, when did you know Sarah was your wife? Pastor Toure:After our first date, I was so fascinated with our time together that I began to seek God about the role she would play in my life. Very early the next morning, He showed me through a series of events that the time I’d shared with Sarah was more than a first date and that it was an evening with the woman I was meant to spend the rest of my life with. Hope: What is a typical day like for you two? Is there a tradition you both share before getting into your day? Each day varies, depending on our schedules, but prayer and sharing breakfast are staples we try to include each day. Whether it’s a bowl of cereal, homemade breakfast, or dining out, we take time to make sure each day is built on the foundation of our connection. Hope: You both have very successful careers outside of the ministry. How do you balance and support each other while keeping things in perspective? We truly believe that God has brought us together to enhance every aspect of our lives. Yielding to one another’s wisdom and guidance as we make decisions in business has engrained a team mentality in our marriage. We avoid a mindset of “yours vs. mine” and instead believe that our success is intrinsically connected. Hope: How do you balance having a blended family? So many things come into play like discipline and education. How do you come into agreement and make it work? We have very similar philosophies for parenting. We trust one another’s perspective of our children and take into account when making decisions. Very rarely do we have polar positions on how we should handle issues that arise, but reminding ourselves to not leave any room for division in our marriage has been beneficial for us. Hope: What are the joys and challenges of serving together in ministry? Pastor Toure:As the ministry continues to grow, there is no greater joy for us than seeing our members evolve in their divine purpose. As that purpose manifests, there are obstacles that must be faced. One of the greatest challenges in serving our community is watching them face necessary obstacles. Though it ultimately increases their faith, we often wish we could protect them from life’s growing pains. Hope: Sarah, are there times where you smile because your mother comes out? Sarah: Most definitely! She’s my best friend and the woman I most admire in life. I constantly notice traces of her humor, grace, and candor in my actions. In those moments, I smile and thank God that neither distance nor time can separate the parts of her that live within me. Hope: What have you learned about yourselves since being married? Sarah:Touré has taught me to be more self-aware, and he taught me to take a look at myself and really define what I want for myself in order to find my purpose. I have also learned to be more patient. Pastor Toure:I have also learned to be more patient since being married to Sarah. She has taught me that you must always be willing to grow for love. It’s important to marry someone you love enough to change for--not change who you are--but someone you’re willing to expand your world for. Hope: You both have authored amazing books. Can we expect a joint book project soon? The only joint venture we’re currently working on is the new life we’re bringing into the world. We’re soaking up all of the love and excitement buzzing in our family and taking a break from any business endeavors. 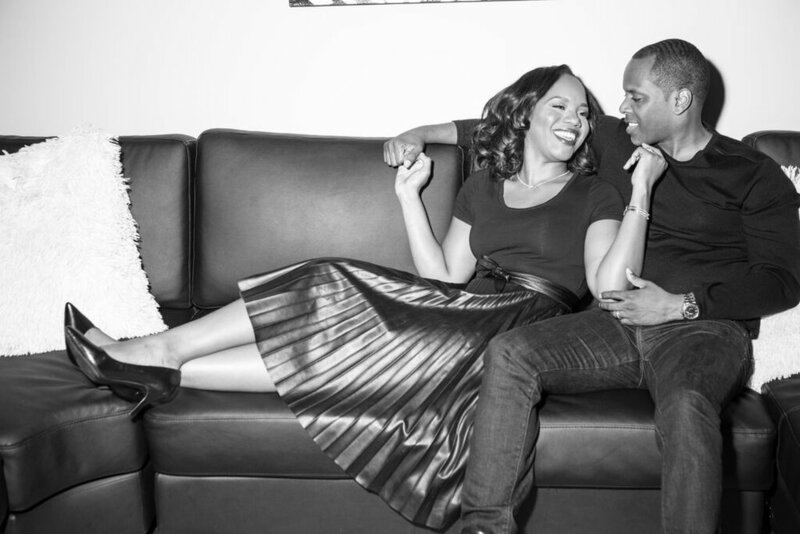 Pastors Toure Roberts and Sarah Jakes Roberts are pastors of One Church LA in Los Angeles, California.